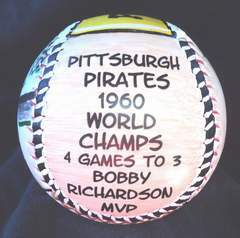 This Legends Hand Painted 1960 World Series Baseball features my original paintings of this great series between the Pittsburgh Pirates and the New York Yankees. Side one is my painting of the game winning celebration. 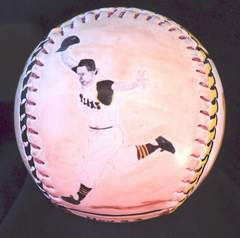 The Pirates Bill Mazeroski circles the bases after hitting the dramatic series winning home run! Click here for a closer look. 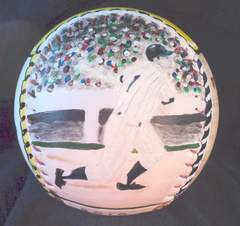 Side two is my painting of the 1960 World Series MVP, the Yankees Bobby Richardson. This is the only time the MVP went to the losing club. Click here for a closer look. 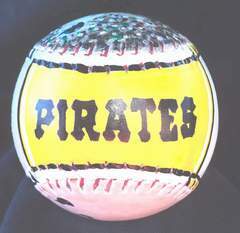 Side three shows my hand painted logos of the Pirates and Yankees. Side four has a few 1960 World Series stats . 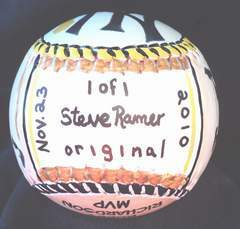 Side five, which is the top of the baseball, has "PIRATES" hand painted in team colors as the winners.